Black tobacco is a tall, air-cured plant for a dark brown color. It is then re-moistened to undergo an active fermentation. 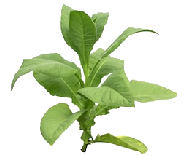 We find this tobacco without additives in brown cigarettes, chewing tobacco or snuff and cigars. Once very popular in France and Spain, its use decreases sharply over time. Its harsh taste and its high nicotine strength make it a very full-bodied tobacco. In a vape juice, the black tobacco flavor is very far from this alkaline smoke, but near its specific taste by the presence of tobacco absolute in its composition. Arom-Team offers you in this category the flavors for a realistic black tobacco electronic cigarette e liquid.